I hesitated in replying to him. I think because I was so happy inside that a friend of mine felt comfortable enough to ask me that question. I forget exactly what I said; I think my response had something to do with cut and variety. What I was really super thrilled about was that I was able to discuss fashion about both men’s and women’s clothes. The conversation wasn’t just about me cross dressing, but at the same time it was. I gave my thoughts and the conversation drifted. We talked about a large variety of things that evening. I think that they were drinking mojitos and Jules and I were doing tequila shots occasionally. At some point B asked another question about my cross dressing and personally I was thrilled. It honestly was so much fun hanging out with friends that I really like and they know that I am a cross dresser and they still like me and aren’t freaked out by it; enough so that they are actually willing to discuss it with me. Wow. What fun. Really. It really, really was. In that moment I was very appreciative of the bravery I showed months ago in revealing to them what I like to do. I had once thought that telling others what I do could possibly be the worst, most horrible decision I could ever make. And instead here I was sitting with my friends who made me feel so touched simply by wanting to know more about what I like to do. I gave him a brief overview of the changing nature of my cross dressing. Basically, it grew from just a few pieces of clothes being worn occasionally to now where I will dress from head to toe, completely including a wig and makeup. At this point, both A and B started asking questions. One I remember was – How often do I dress? - Answer – A couple of times a month or so right now, as it is duck season, but it changes, non-duck hunting months, maybe from 2 -4 times per month, during vacations, it often becomes much more frequent; often while on vacation, especially driving ones, I will only even take girls clothes with me. Another question that I remember B asking was – what is the look that you are going for? Answer – just another average girl. At this point Jules started saying that I should just pull out my ipad and show them pictures of me on my website. Do you remember that I like to be pushed? Occasionally I will really feel the shove of the hand and this time I almost fell. Wow, show someone, besides Jules, and the millions of strangers who have seen me while out and about. This startled me. I mean, it is one thing to tell someone that you cross dress and an entirely different thing to then put yourself out there for potential critique. Wow. Five years ago, oh hell no. Five years ago they would have never known. But day by, week by week, month by month, year by year, I have pushed myself hard for me to be okay with myself. If I am okay with myself, then what could be said that could hurt me by them? I took a shot of tequila, a deep breath, and opened my ipad. Very quickly my site was loaded and then my friends were looking at me dressed as a girl. I think that I dissociated from myself then as I do not have very clear memories of what their initial reactions were, or it could have just been the tequila shots. Either way, Jules and I both remember that the reactions were very positive and supportive. A, the female of A and B, liked my look. What I was thrilled about was that she said there were a couple of outfits that she liked. She told me that she liked my wig; that it looked good on me. She was also quite amazed at the pictures of my cleavage and was surprised at how completely hairless it was. (She has seen it otherwise.) She also said that she would not recognize me if she saw me out in the world. I have some vague recollection that B said something positive about my looks. And then it was done. I didn’t die. The world didn’t end. My friends saw me as Nadine. And all was well with the world. In reflection the evening was one of the best times I have ever spent. I was so happy with them as friends, but I was also thrilled with myself. And being thrilled with myself is one end result of me working hard with my own perceptions of myself. Love yourself more and find the ever elusive happiness. There is hardly a greater pleasure than being able to talk freely, without pre-editing, after a lifetime of biting your tongue and second-guessing yourself. I have that with my sister-in-law, and it *is* thrilling. Congrats on another big step forward. And aren't you glad that you had pics with heads on your blog? Thanks for writing Leslie Ann. Yes I am very happy that I had pictures with heads on my blog. Yet another small thing that I practically had to force myself to do that in the end turned into a very positive thing. Thanks again for the push. Oh, Alcohol, how it sometimes leads to interesting adventures. I too have had friends, who after several drinks all around, have asked some interesting questions. I am very open, and I don't get offended, so I tell my "in the know" friends to ask away. I am always happy to answer any and all of their questions about cross dressing/trans stuff. In a way, it helps me work through some thoughts out loud while enlightening some new people. I have thought I would enjoy answering people's questions but never really had the chance. This couple is the first apparently that feels comfortable with asking me questions and I love it. I agree that it has helped me be better aware of myself. What an uplifting post. Positive in all regards. Another fear barrier removed. I would love to have someone who would be happy and comfortable discussing my crossdressing. My wife is wonderful but she has her fears and concerns that I choose to honor. I am glad to see that your wife pushed you to share yourself with your friends. I really didn't know how much I would enjoy being able to talk about my cross dressing with others. My wife has been open to it, and we have done it, but I have almost felt a sense of obligation from her regarding it. I think it's not true, it's just what I have felt. But being able to talk with someone outside of my marriage, or this blog even, has felt wonderful! I too am happy that my wife pushed me to share further. She is a good woman. Hi all I am B of A and B. I have been reading Nadine's post for some time now and have been struggling to write something. I say struggling because this has all required me to look at myself at the same time and deal with my own personal demons that I live with everyday. The courage that Nadine has shown through all this has led me to be willing to at least give myself the opportunity to accept my own feelings and share more with my wife about my secret. My wife has always known about my secret but never knew the extent or all the details of my experiences in the past, which after several years of marriage is slowly coming out in conversation all thanks to Nadine's courage. Now I have to admit I had a fairly good idea from some things I had witnessed from previous visits we had with Nadine and Jules what Nadine's secret was but I had no idea to what extent and it did not matter and or have an impact on my impression of him what so ever. Not because of my own secret but because he was a wonderful person and it really didn't matter what the secret was I already cared deeply for this person I had gotten to know. That being said I have to admit I was rather curious to know the extent of Nadine's secret but I was also scared for Nadine just the same because I knew it was difficult to harbor something so personal. 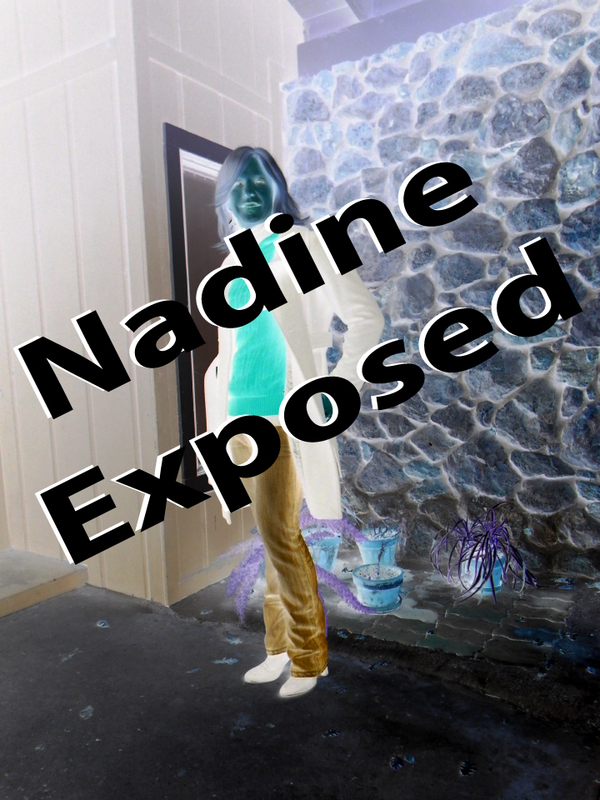 I knew under garments were involved and that Nadine was not into males sexually at all, as that topic had been brought up in random conversation in the past. 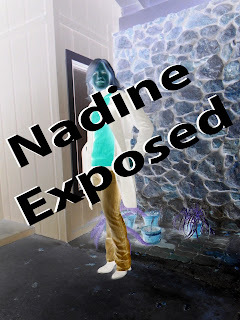 Once Nadine shared his secret with A and I Nadine had a glow about him when he spoke about it. It was easy to see he was uncomfortable yet comfortable at the same time. I don't think he felt comfortable at the time but I could see from the glow on his face that there was a freeing since coming over him. That glow which I don't think he realizes exist when he speaks about dressing up until he reads this post (probably shouldn't shared that because its so wonderful to see) is what drove A and I to want to ask more questions and get to know the "real person" we had already grown to love. Outfit for Monday 1-14-13 - Love the Boots!